We’d love your help. 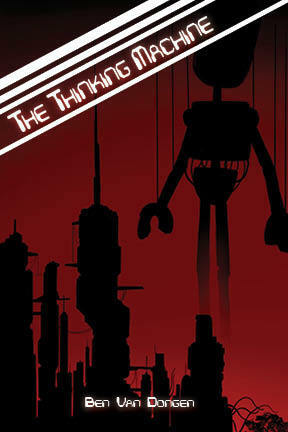 Let us know what’s wrong with this preview of The Thinking Machine by Ben Van Dongen. A Man and a Monster with the Same Name. In a city that spans most of the eastern sea-board, there is a creature that used to be a man. A stranger, from the shrinking wilds of the north, is called by a spirit to enter the city and destroy the abomination. The thing that shares his name. Zed. To ask other readers questions about The Thinking Machine, please sign up. There are three things I love in this world. 1) Cyberpunk stories. 2) Chinese food. And 3) kittens with short legs. And guess what, The Thinking Machine has two of those things (I’ll leave it to you to find out which two). The Thinking Machine follows a guy named Zed as he leaves the comfort of his country lifestyle to head into the city in search of…another guy named Zed. Sounds weird, I know, but hang in there, the story is worth it. This thing is a cyberpunk thrill ride (fans of Blade Runner de There are three things I love in this world. 1) Cyberpunk stories. 2) Chinese food. And 3) kittens with short legs. And guess what, The Thinking Machine has two of those things (I’ll leave it to you to find out which two). This thing is a cyberpunk thrill ride (fans of Blade Runner definitely need apply). The book itself is slim—its dimensions evokes pleasant memories of the classic sci-fi pulp novels of yesteryear—but it packs a punch. From the moment Zed enters the sprawling metropolis, the narrative goes ball-to-the-wall. This fast pace pairs quite nicely with the urgency of Zed’s own situation. Just as one plot thread is resolved, we are blasting toward the next. The city in The Thinking Machine isn’t just window dressing either. It has character, and an immense presence felt throughout. In fact, there was so much going on in this place that I would love for Ben Van Dongen to come back to it. I need more! As you can tell, I really liked this one. Its size, coupled with the fast pace of the story, created a perfect little escape from reality. Hopefully there are more stories to be told in this world, and I’m keeping my fingers crossed that they involve a stumpy-legged kitten (even in the background). I loved this book. It read very quickly and kept me engaged throughout. The characters were strong and interesting. It left me wanting more. Can’t wait for the next one! A lot of good ideas, unfortunately it read like a video game script. Ben Van Dongen grew up in Windsor Ontario. He likes to think that if he tried harder he could have been an Astronaut, but he is happier writing science fiction anyway. He co-authored the books No Light Tomorrow and All These Crooked streets, and is one half of the founding team of Adventure Worlds Press. His first solo book, The Thinking Machine, a cyberpunk novella, came out last year and the unc Ben Van Dongen grew up in Windsor Ontario. He likes to think that if he tried harder he could have been an Astronaut, but he is happier writing science fiction anyway. He co-authored the books No Light Tomorrow and All These Crooked streets, and is one half of the founding team of Adventure Worlds Press. His first solo book, The Thinking Machine, a cyberpunk novella, came out last year and the unconnected sequel, The Neon Heart, is now available.